Shri Vallabhacharya was a great saint of Indian history. He was the founder of Pushti sect or Pushtimarg. Shri Vallabhacharya is one of the most famous saint belongs to the Vaishnava sect. Shri Vallabhacharya Jayanti is the celebration of the birth day of Shri Vallabhacharya. He was the great saint and believed to worship lord Krishna. The birth day of Shri Vallabhacharya is as on 10th of April month according to his teaching school. This date varies each of the years according to Hindu calendar. He was prayed a famous form of lord Krishna as Shrinathji. According to his ritual thoughts just worshiping of lord Krishna is the way to get Moksha. There is a famous belief that the saint Shri Vallabhacharya got a Darshan of lord Krishna. 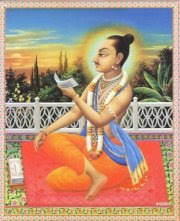 Shri Vallabhacharya thought about monism and about a school of philosophy named Shuddhadvaita. Rajasthan and Gujarat states of India are the major places of Vaishnavas. There are some places of Shrinathji following the sect of Pushti. In Nathdwara there is a popular temple of Shrinathji which is a part of Pushtimarg or Pushti sect. this is the place which is famous among Vaishnavas. Some of the other temples of Lord Krishna in Gujarat are also famous for this sect of Pushti. People from Vaishnava religion celebrate Shri Vallabhacharya Jayanti with a great pleasure each year.